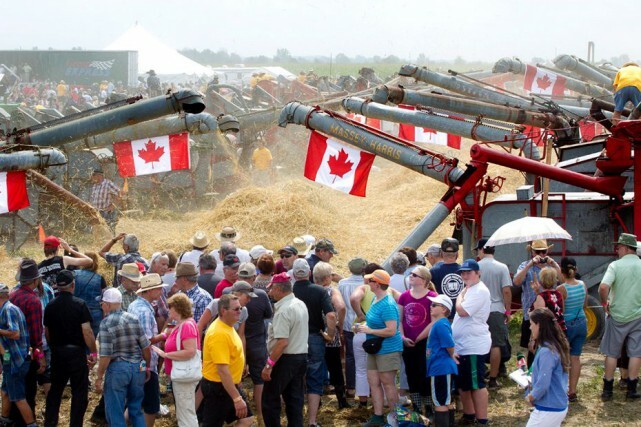 On August 15, 2015, Richard, Steve And Josh Wilson headed to St. Albert ON (on the Quebec border) to participate in a World Record Breaking Threshing Bee held at the St. Albert Curd Festival. 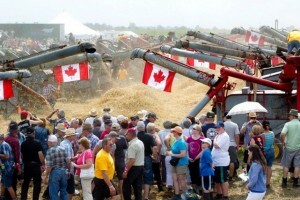 Francois Latour and other organizers promoted the event heavily in hopes of inviting enough threshing machines and teams to beat the previous record of 41 Threshers running simultaneously for 15 minutes, held by Saskatchewan. All proceeds from the Record attempt were ear marked for Breast Cancer Research, a horrible disease from which Francois’ wife was suffering. After a 5.5 hour drive, Richard Steve and Josh teamed up with Allan and Judy McLellan of Franktown and their beautifully restored 1916 Waterloo Steam Traction Engine. 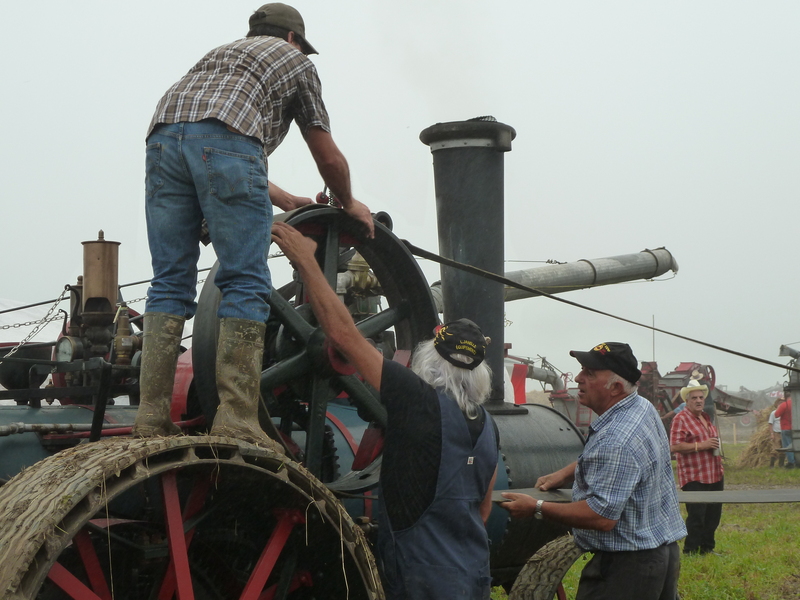 There was a remarkable turnout and support from farmers, collectors, and enthusiasts from all over the Province of ON and PQ. Old threshing machines were uncovered and pulled out of storage, some of which hadn’t seen the light of day in 40 years! After dusting off the decades, and evicting the odd raccoon (! ), they were inspected and then belted up to a large range of equipment. 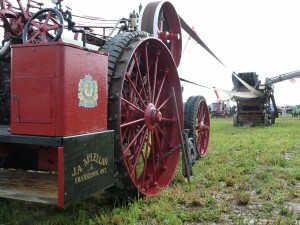 Many makes, models and years of antique tractors as well as Steam Traction engines were used to provide power to the threshing mills, even a horse on an antique treadmill!!! 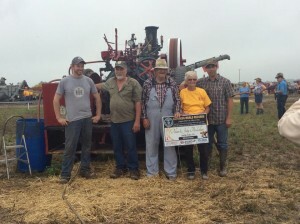 It was one of the longest, hottest 15 minutes, however when the final signal blew, the old record has been absolutely SMASHED with a total of 111 threshers simultaneously operating for 15 minutes! The excitement and comradery was palpable and electric, not only for setting a new record but for the funds raised for Breast Cancer Research. Sadly it was bitter sweet as Francois’ wife succumb to her cancer the following day. However, the Horseless Carriage Museum was so very proud to participate in, and help set this unprecedented Guinness World record as well as raise awareness and funds for Breast Cancer Research! Threshers lined up ready to break the record! Allan & Judy’s 1916 Waterloo Steam Traction Engine belted up to their threshing mill. Steve adjusting the belt on the fly wheel of the steam engine. 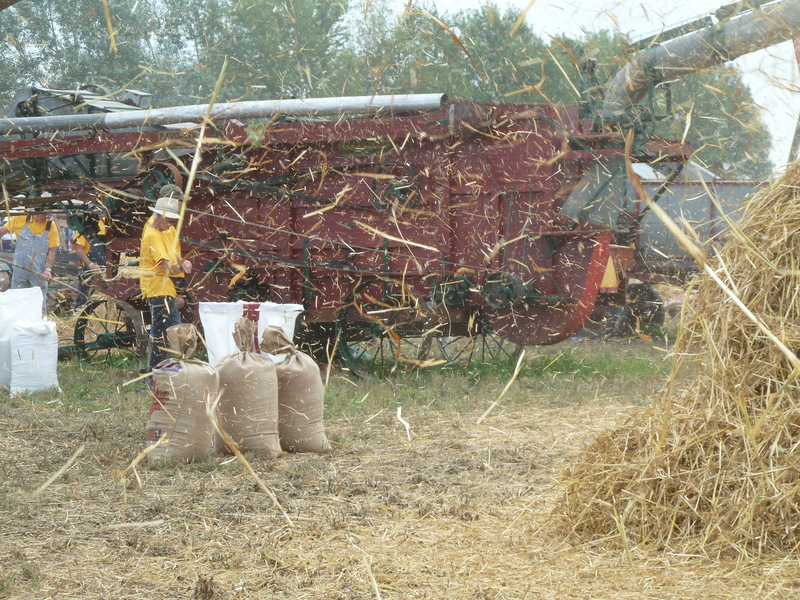 The straw and chaff are flying!